NEW YORK, May 22, 2018 – Black women in the U.S. are 40 percent more likely to die from breast cancer than white women1, and a recent study found that while 92 percent of black women agree breast health is important, only 25 percent of women have recently discussed breast health with their family, friends, or colleagues and only 17 percent have taken steps to understand their risk for breast cancer.2 To address the unacceptable disparity in breast cancer mortality rates, Susan G. Komen®, the world’s leading breast cancer organization, and the Ad Council, the nation’s foremost producer of public service communications, launched Know Your Girls, a national campaign to educate and inspire black women to understand their risk for breast cancer and take charge of their breast health. 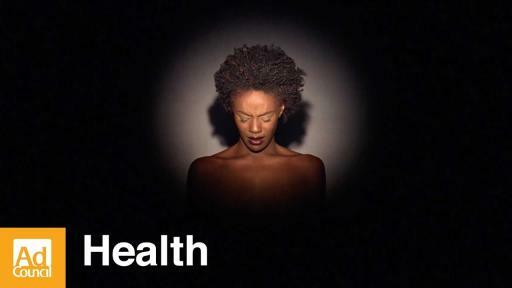 Black women are more likely to be diagnosed with breast cancer younger, at later stages and with more aggressive forms of the disease, limiting treatment options. 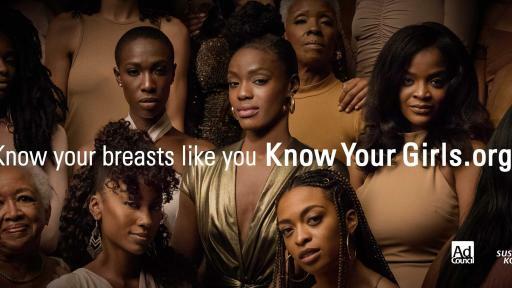 The Know Your Girls campaign encourages black women, ages 30-55 years old, to treat their breasts with the same attentiveness and understanding they share with the women in their lives. The campaign video, created pro bono by award-winning creative agency Translation, features vignettes of a woman at key moments throughout her life. At each occasion, she is surrounded by her girls, the friends and family who have always been her source of support and strength. At the end, the woman reveals that the “girls” who have been with her in every single moment of her life, her breasts, are in fact the ones she might know the least. 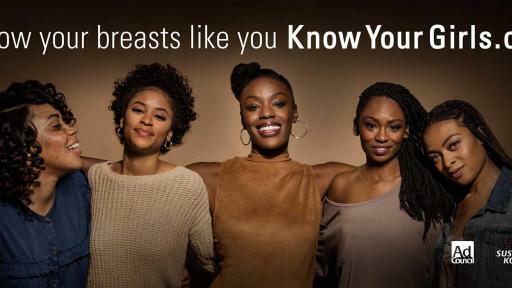 The campaign also includes brand new social media channels, launched in collaboration with digital marketing agency Good Stuff Digital, that aim to create an online community where black women can come together to talk honestly and openly about their breast health and show support for their sisters. 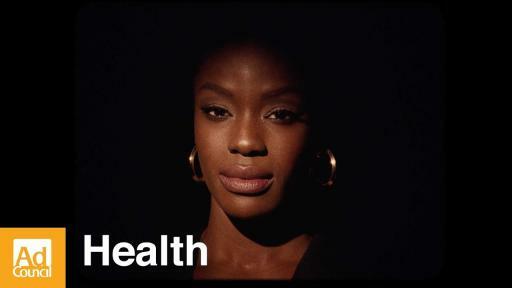 Through their African American Health Equity Initiative, Komen is already working to reduce the mortality gap between black women and white women by 25 percent, focusing first on the 10 cities where mortality rates and late-stage diagnosis of black women are highest. 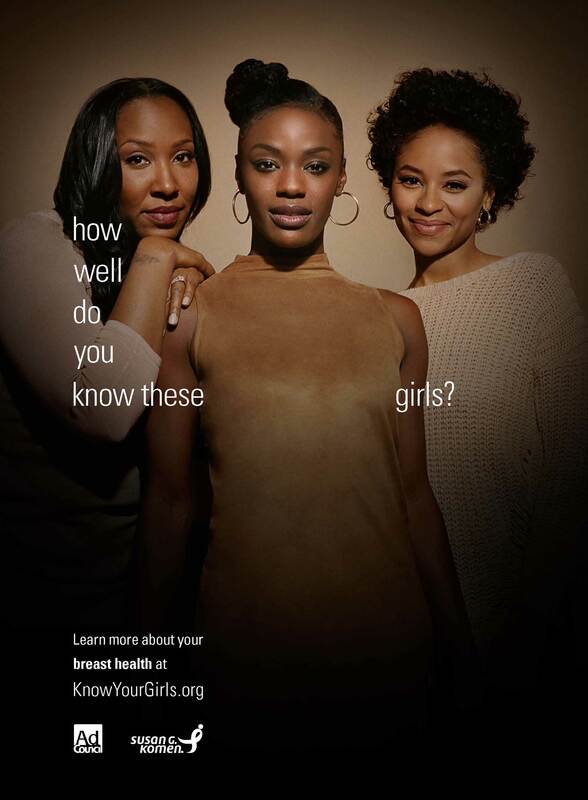 The Know Your Girls campaign will target outreach in these 10 cities to amplify those efforts: Memphis, Tennessee; St. Louis, Missouri; Long Beach/Los Angeles Metro Area; Dallas/Fort Worth/Arlington Metro Area; Virginia Beach, Virginia; Atlanta, Georgia; Chicago, Illinois; Houston, Texas; Washington, D.C. and Philadelphia, Pennsylvania. In some cities, the disparity in breast cancer mortality rate between black and white women is as high as 74%. Across the country, Susan G. Komen’s network of local Affiliates will lend their support to the campaign and promote its work across their channels. The Know Your Girls PSAs were directed by A.V. Rockwell, who has created short films like Feathers and The Gospel, and include singer Alicia Keys’s hit song “You Don’t Know My Name.” To amplify the campaign’s message, Know Your Girls is partnering with Coming to America actress and breast cancer survivor Vanessa Bell Calloway, who provides the voiceover for the PSAs, celebrity stylist June Ambrose, actress and comedian Regina Hall, E! News co-anchor Zuri Hall, 2 Dope Queens co-creator and actress Jessica Williams, singer-songwriter, producer and actress Michelle Williams, and comedian and actress Kym Whitley; as well as digital creators Black Moms Blog, Ebony from Team2Moms, Glamtwinz: Kelsey & Kendra Murrell, Jade Kendle, Tianne King, Megan “Megz” Lytle and Jayla Watson. Facebook has signed on to support the campaign through donated media and a partnership with their Creative Shop. WWE will support the campaign through its global media assets including TV, digital and social media. Several media partners have also made commitments to the Know Your Girls campaign prior to launch including Oath and Aspire TV. The new creative is being distributed to media outlets nationwide and will run in donated time and space per the Ad Council’s model. To learn more about the campaign, visit KnowYourGirls.org or join the conversation using #KnowYourGirls on Facebook, Instagram, and Twitter. Susan G. Komen is the world’s largest breast cancer organization, funding more breast cancer research than any other nonprofit outside of the federal government while providing real-time help to those facing the disease. Komen has set a Bold Goal to reduce the current number of breast cancer deaths by 50 percent in the U.S. by 2026. Since its founding in 1982, Komen has funded more than $956 million in research and provided more than $2.1 billion in funding to screening, education, treatment and psychosocial support programs serving millions of people in more than 30 countries worldwide. Komen was founded by Nancy G. Brinker, who promised her sister, Susan G. Komen, that she would end the disease that claimed Suzy’s life. That promise has become Komen’s promise to all people facing breast cancer. Founded by Steve Stoute in 2004, Translation has a strong heritage in helping Fortune 500 companies thrive in contemporary culture. Today, Translation has evolved into a full-service communications agency servicing key clients including State Farm, NBA, Kaiser Permanente, Google, DSW and the Brooklyn Nets. The agency is dedicated to creating transformative ideas that don't just market a brand differently, but change how that brand resonates in culture. In order to stay attuned to the influential edge of pop culture, Translation employs culture creators who often complement their day jobs with secondary careers in art, fashion, music and entertainment. 1 Cancer; Facts & Figures for African-Americans 2016-2018, American Cancer Society, p. 12. 2 The Ad Council’s survey was conducted by Ipsos Public Affairs in February-April 2018. 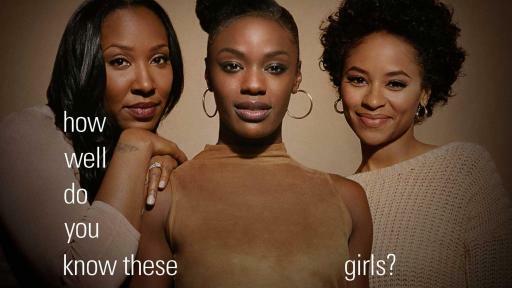 The nationally representative online survey included 810 black women ages 30-55.